The days of summer vacation are fast approaching and the children have been busy bees preparing for their Summer Show at school! Every day for the past two weeks, the twinkling of little girl voices practicing songs and the twirling of dance moves have been spotted around corners or in the backyard or from the rear view mirror while driving. There is a day show for the older children and the Kindergarten classes prepared their show for night. After the night show, the Kindergarten teachers prepared a special video for the parents of all the photos taken throughout their first year at school. It will be a full day for us tomorrow! Lana just reminded me today that I had checked off that little box on some passing note saying I would contribute to the festivities by bringing cookies. Oops! What should we make? After much debating, we decided on Walnut Thumbprints. 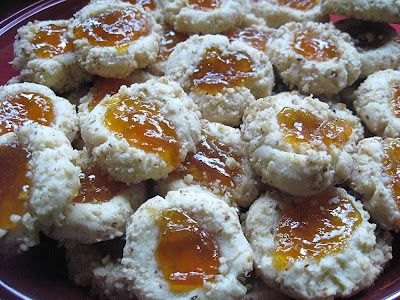 I promised Lana that she would like them even though apricot jam over chocolate was quite a hard sell. Lana and Sophia helped roll and press the cookie balls and I filled them with jam to bake. They taste as delicious as they look! 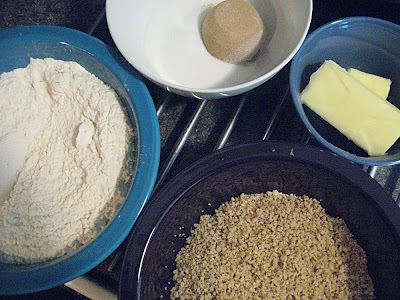 In a large mixing bowl, beat butter and both sugars until light and fluffy. On a low speed, add flour mixture. Put walnuts in shallow bowl. Roll dough into 1 inch balls and then roll in nuts. Place 2 inched apart on baking sheets. Make a thumb impression in the center of each cookie. Spoon jam in each print. *TIP* for cooking with little kids! I prepared all the ingredients ahead of time in separate bowls. The girls were able to help add the ingredients with a minimum amount of mess and it made for a quicker, more enjoyable baking experience (for all of us)! I am going to try these tomorrow. I needed a new cookie recipe, the tub of Toll House just gets eaten raw lately.